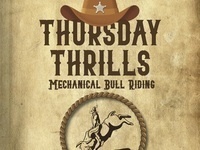 The SHSU Program Council presents Thursday Thrills! All students are invited to get their adrenaline pumping by riding a mechanical bull for free! Must bring a valid SHSU student ID to participate.